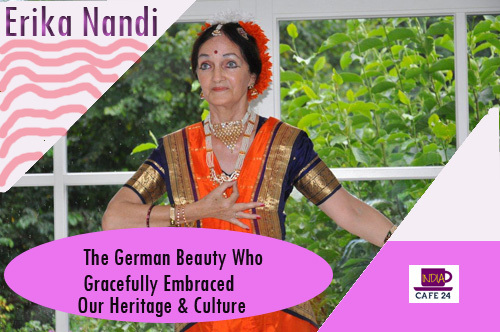 The German Beauty Who Not Only Got Adapted To Our Country But Also Gracefully Embraced Our Rich Heritage Of Classical Dance Forms. No words can rightfully define the elegant dancer Erika Nandi. 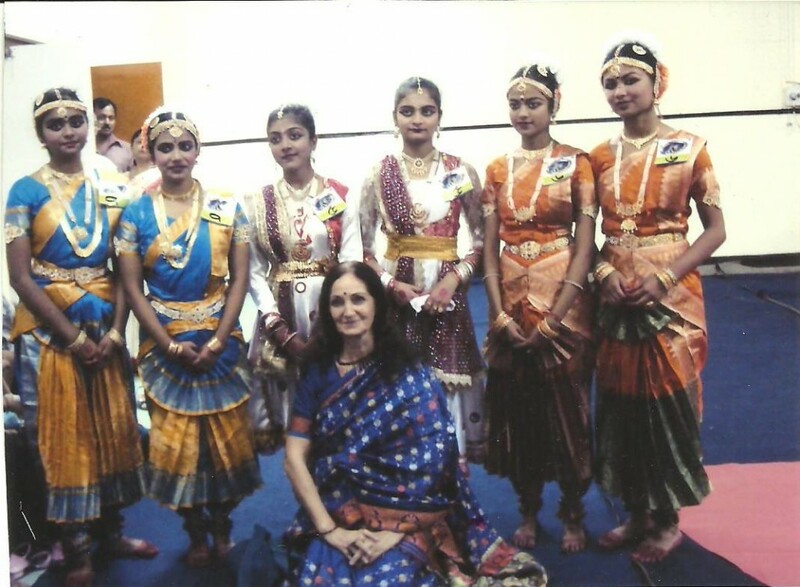 A German by birth, came India to learn our classical dance forms and decided to impart the knowledge in the young aspirants who wished to grove their legs in a classical way. Indicafe24 is honoured to have such a talent amidst us. Join us and let’s together begin today’s session. Indicafe24 feels proud to have you amidst us. Let’s begin with asking you to introduce yourself to our readers. Day–dreams of dance, drumming and drawing can turn into reality. – Being a German didn’t mean to me to stay in the same place. Since childhood mysterious continents like Asia, South America and Africa attracted me. I found my luck of becoming a dancer in India. Did you always want to be dancer? How did you happen to come across dancing? Wanting to become a dancer was one of my dreams deep down in my heart; – “in a way like a hobby and passion turning profession”. – Dance is part of social life in the West. I saw my parents dancing the waltz, foxtrot, tango (standard dances) etc. – Around the age of 13/14 boys and girls undergo at least one basic course of social dancing in the West. At what age you took your first step towards dancing? Apart from dancing around on my own, my first consciously acquired steps were through my classical Ballet lessons at the age of 10. After three years of Ballet training, my father (Werner Marbach) worried that it was an unnecessary distraction and I had to give it up. While growing up who was your inspiration? Under whom did you start your baby steps? My mother Erika Marbach (nee Sander) was the daughter of a concert master (Gustav Sander). Classical music was practiced on the piano, violin, cello and vocally. She recognized my “restless inclination” and admitted me to the Ellen Cleve Ballet School in Kiel. Tell a little about the family, house, and ambiance you grew up in? I grew up in post war Germany in Friedrichsort (a suburb of Kiel) a place near the Baltic Sea. My parents were refugees, and having left their properties behind, had to start from scratch staying in a flat. – My education began in the local primary school and from class five I shifted to Higher Secondary School, where also English was a compulsory subject. Children in Germany do not have a choice of an English Medium School, and all studies are in German. – Having no brothers and sisters did not make me feel lonely, and I loved to keep busy drawing, singing and dancing. My routine consisted of School at 7am, lunch at 1pm after which I had to do homework. In the evening I played outdoors with the neighbors’ daughters, and 7pm was dinner after which it was strictly bedtime. I was not a brilliant student. After my matriculation I graduated as draftsman and was an apprentice at the same time in the nearby firm, the MAK, which produced at those times locomotives for Chittaranjan (India). I would rather have liked to go to Berlin for further training in dance, but in those days one was not allowed to stay on one’s own below the age of 21, and my father did not see any value in dance. 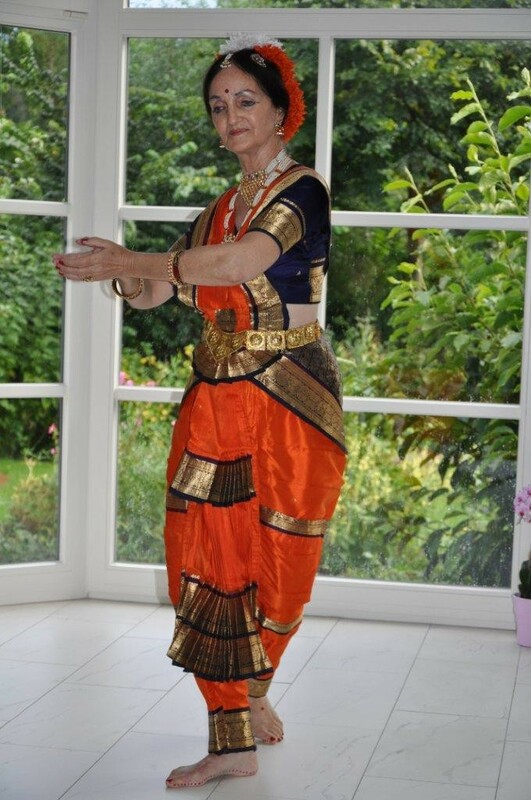 You are a German by nation, how come you developed an interest for Indian Classical Dance forms? There exists only a single classical dance form in the West, which is the Ballet, with its origin in Italy (“balare”= to dance). Through documentaries and travel reports I came to know that there are so many different dance forms all over the mystic East. Being attracted to cultures of Asia since childhood, it happened that India became my destiny. In 1962 I came to know my future husband, Mr. Simanta Kumar Nandi, who had come to Germany along with a batch of Indians, who wanted to study engineering. At that time the Indo-German Society was formed, due to which many cultural events took place. Dancers like Mrinalini Sarabhai, Sonal Mansingh and the Jhaveri Sisters cast a spell on me. I can’t express the magnetic attraction by the rhythm and expressions ultimately India meant dance to me. Tell us about your journey in India, the hurdles you had to overcome. What all dance forms do you expertise in? Is it difficult for a foreigner to find a dance platform in India? End of January, 1969 we came to India with our little son, Jens-Sudip. My husband’s eldest brother (Advocate of the Supreme Court) received us in New Delhi. It was a tough day, as I found dinner is served very late in India. – We proceeded by train to Kolkata, which was quite entertaining. Out there we were heartily welcome in my husband’s sister’s house. It was in January 1970, that I saw the Assamese Bihu dance for the first time. 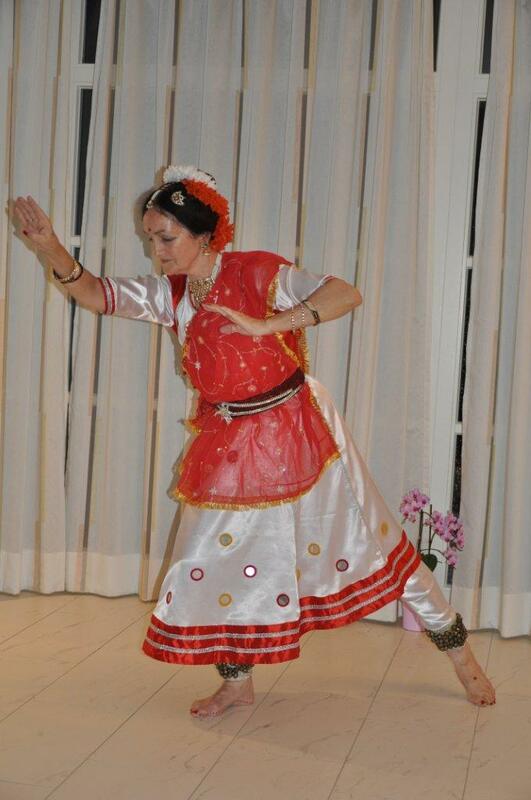 After learning this folk dance I became successful, and after having appeared at the Assam Sahitya Sabha in 1972, I had regular calls to dance all over Assam and around for the coming 10 years. – Meanwhile I discovered a liking for Kathak Nritya. From 1976 I began to go to Kolkata frequently to learn under late Pdt Ramgopal Misra and his wife Sushmita Misra at the Jailal Academy, and danced in the institutions’ annual events. In 1981 I won the Silver Medal at the All India Competition under the Allahabad Prayag Samiti. Side by side I also tried myself on the Tabla. 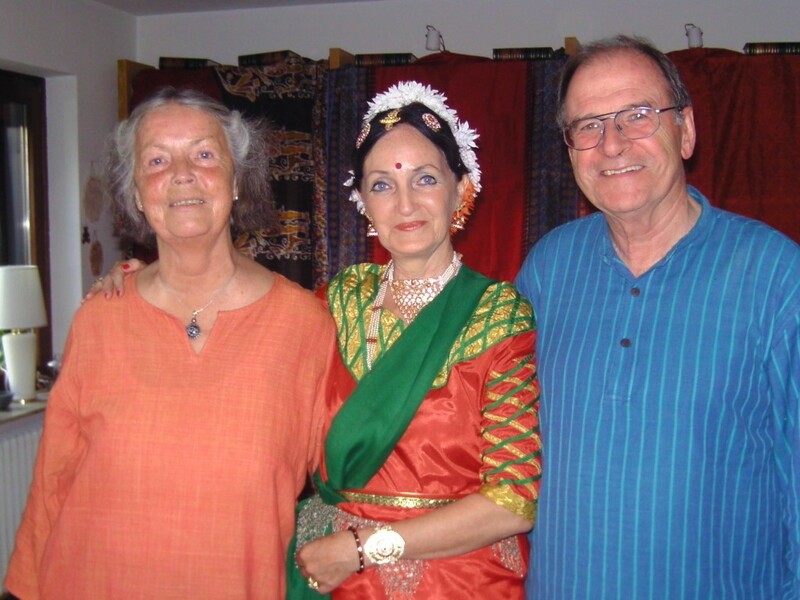 – In 1978 I had the luck to find my Bharatanatyam Guru, and started learning under the wonderful guidance of Smti Thankamani Kutty of Kalamandalam Kolkata and tried myself in the art of Sattriya Dance under Guru Sri Bijoy Krishna Goswami. Tell us a little about the training sessions you yourself conduct as a teacher in India and worldwide. After running the dance department for three years, I decided to return to Dhubri and continue full time classes in my residence, “Rechak” which I never had abandoned fully, and kept it going through able assistance of my senior students. From 2010 to 2014 I kept having Workshops in Germany, as I went there to visit my ageing mother. The interest of a very few German students was remarkable and they learnt full items which they performed attractive ly. 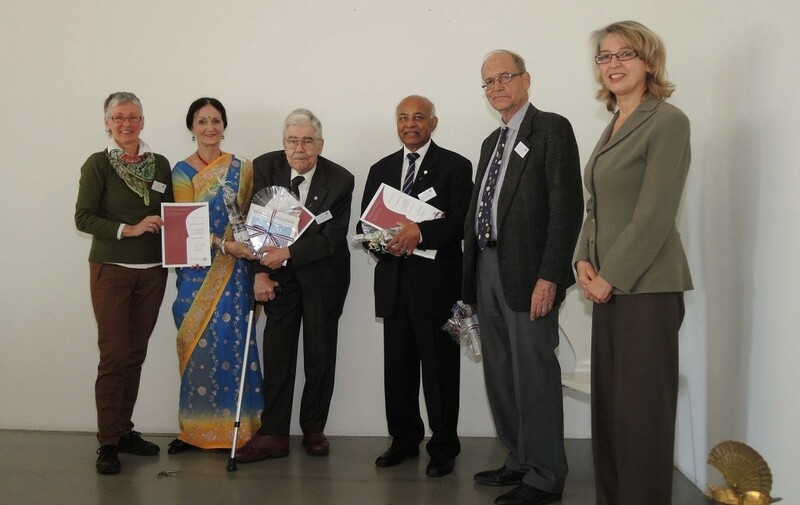 – We also performed in the Indo German Society (head office in Frankfurt), which recognized my activities in India and Germany, and lead to the very great honor to being felicitated with the Silver Needle in 2013. Among many felicitations, recently another great honor in Assam was the “Eideu Handique Award” (named after Assam’s first actress) – I am happy to say that it was me who brought the Indian classical dances to this corner of Assam. Many of my students have won competitions and also performed on Doordarshan including live shows, previous students keep me informed about their further progress and success in their field of classical dance, and in Dhubri itself some of my own senior students teach in their own way. Even today how do you prepare yourself for a performance? At what age did you have a live stage performance? Were you nervous then? Do you get nervous even now while performing live? In case of a performance I do take time out for undisturbed practice. I prefer liquid diet and boiled food and like to spend my time in solitude. With age now I still dance, but I am keener to let my students dance. I dare say that I have only danced whenever requested, as I don’t like pushing for a chance. My first real stage performance was at the age of 24 and I remember that I was too eager as to be nervous. 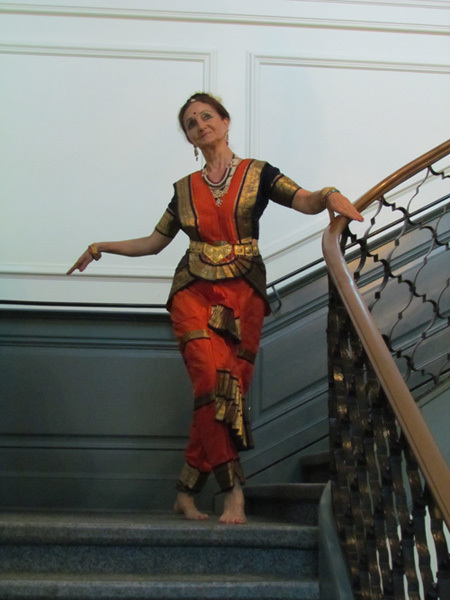 – After plunging into Indian dance I realized how little I knew. The more I knew, the more nervous I became, and learning has no end. One does get excited and wants to live up to ones expectation, and the circumstances can never be predicted. An interested audience certainly radiates a positive chemistry towards the performer, leading to a heavenly feeling, which one wants to retain. Who is your role model? Which Dance Guru do you idolize? As role model I cannot mention one name alone. The first Kathak dancer I came across to admire was Malabika Mitra, and through her my Kathak Guru became late Pdt Ramgopal Misra and his wife Sushmita Misra and at the same time I took Tabla training. 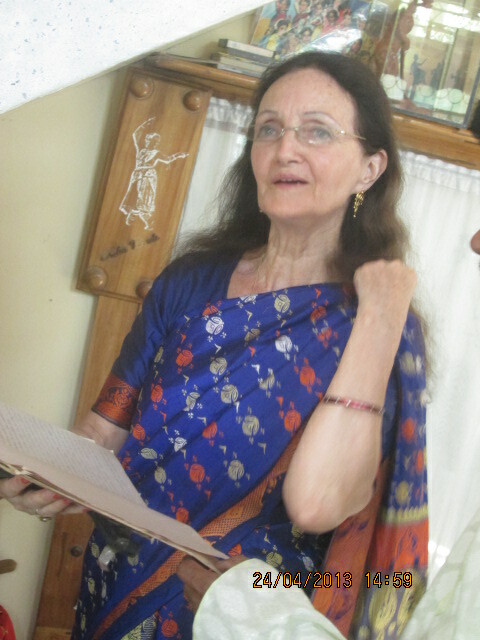 In Germany my first powerful attraction was the Bharatanatyam of Sonal Mansingh and Mrinalini Sarabhai, and it was in Kolkata that this urge was satisfied through Bharatanatyam Guru Smti Thankamani Kutty, staying in Assam I took a Sattriya course under Sree Bijoy Krishna Goswami, while late Sri Bhagawati and Sree Mridul Chetia Phookon guided my Bihu technique. Apart from the initial grooming, which made me stage ripe, I found it necessary to keep up-to-date by joining workshops under the great Pdt Birju Maharaj, Mamata Maharaj, Saswati Sen, Rani Karna and Marami Medhi. As for the south Indian dance styles, my admiration goes to Yamini Krishnamurthi, Priyadarshini Govindh and so many like Yamini Reddy (whose Kuchipudi dance in Khajuraho I can never forget) as well as recently the Kathak dancer Vishal Krisha here in India which has so many outstanding classical dancers. Dhubri is a very remote place, so I love watching DD Bharati, which is a TV channel, rich in classical culture. Tell us a little about your life in Dhubri, about your better half Mr. Nandi, your children, and your beloved grandchildren. Our children studied in Kurseong and later in Shillong. Now our son is settled in Germany with his wife. My daughter Natascha stays with her husband in Dehradun. Our grandchildren are Karan, who studies law and also learnt to play the Sarode, and Karishma, who studies mass communication and completed her Bharatanatyam degree. 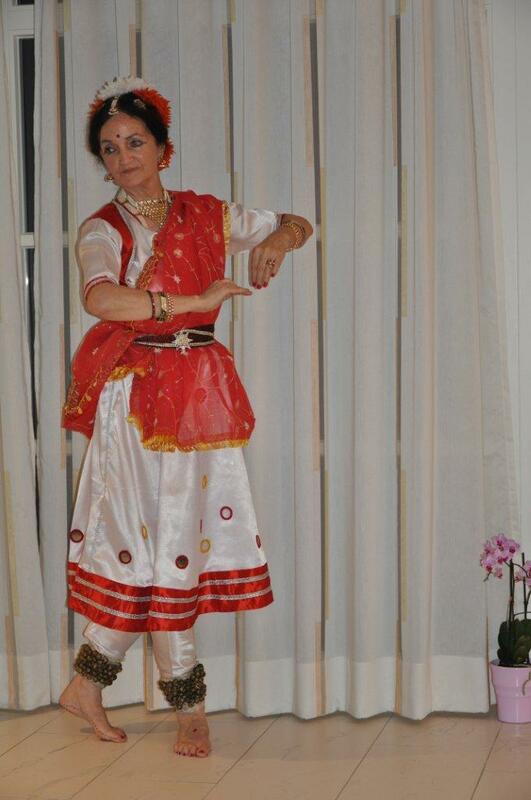 I am also proud to say that my daughter mastered her Kathak and we did quite a few programs together. 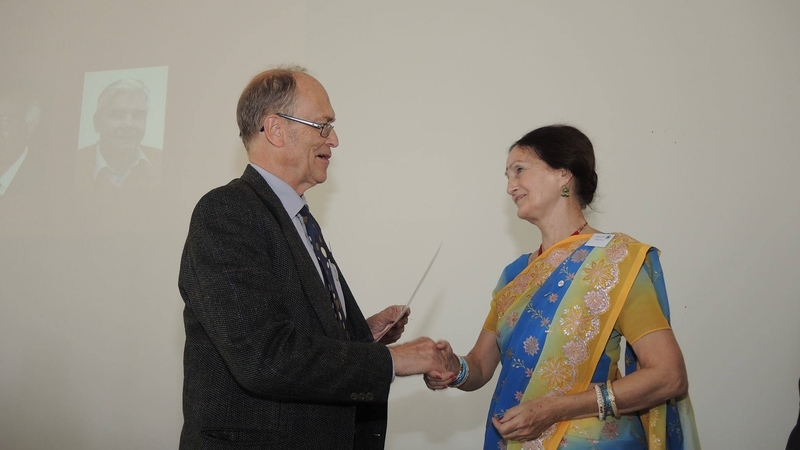 From Germany to Dhubri…. tell us in brief about the experience. 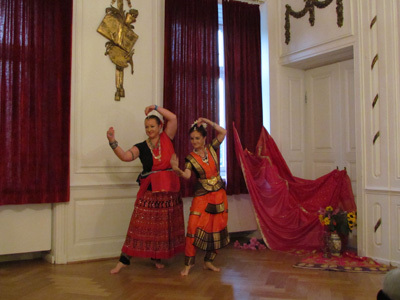 In terms of dance it was a change from the toes of Ballet to the heels of Indian classical dance. – I was only too eager to experience a cultural change including the language and script. To be frank, I had hoped to stay in a town like Bangalore. The climatic change is still quite uncomfortable, but I do not want to complain, and we have beautiful sceneries all around. The food habits are certainly also very different, and in a remote place like Dhubri one should care to stay healthy. All in all, everything is an expected adventure. Finally, what message shall you convey to all those kids and adults out there who are dreaming of a career in Indian Classical Dance Forms? There are two types of dance: the one kind, which may be just a kind of relaxation, not needing any guidance, or the academic, classical dance. Even folk dances have become academic these days in India. For classical dance my message is that, of whatever the choice ones aim is, one should keep ones dreams alive and work with dedication towards fulfillment. One should not get disheartened through discouragements. It is important to select the right Guru or teacher, who wants the best for the disciple. One should keep informed regarding the all over dance scene in the country. Dance may also include acrobatics, martial arts and yoga. Dance spreads the joy of possessing a healthy body, and expressing the meaning of lyrics through adequate gestures and mime. It will be very genuine to study the scientific scripts like Abhinaya Darpana and Natyasastra side by side, eagerly bringing the theory alive, adding to the dancer’s gravity. We can’t thank you enough for taking time out of your busy schedule and answering the above questions for us. It was a pleasure talking to you. Hope we will have you amidst us time and again! 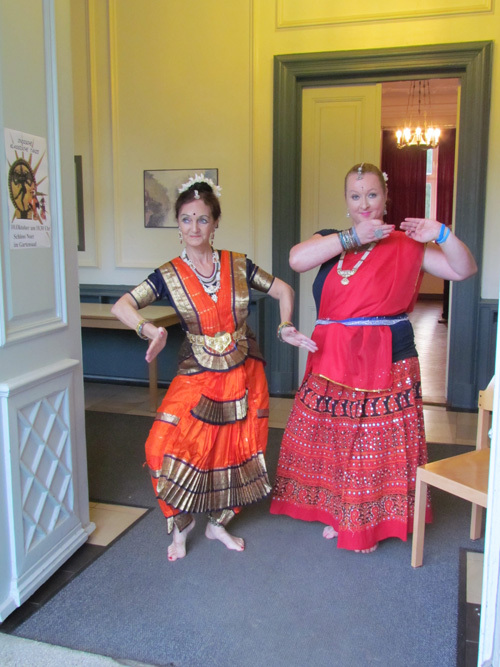 Utsava Dutta was privileged to have completed her VISHARADH in Bharatnatyam under the guidance of “Guru Erika Nandi”. My uncle married a German woman in the late 1950 and both settled in Frankfurt. He is Indian and passed away 3 years ago in 2014. His wife Erika Nani Kisoor still lives in Frankfurt.